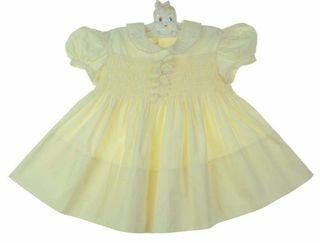 This sweet yellow cotton dress was hand made in the Philippines in the 1940s by Feltman Brothers. 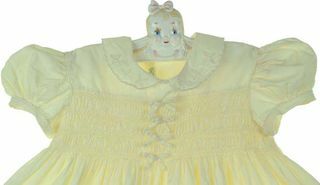 It features a smocked bodice centered with four tiny yellow bows. The short puffed sleeves are finished with turned back scalloped cuffs. Openwork and embroidery accent the scalloped collar. It is finished with a deep 4" hem. The smocked back closes with three small shell buttons. This would be a darling vintage portrait dress for your baby girl!